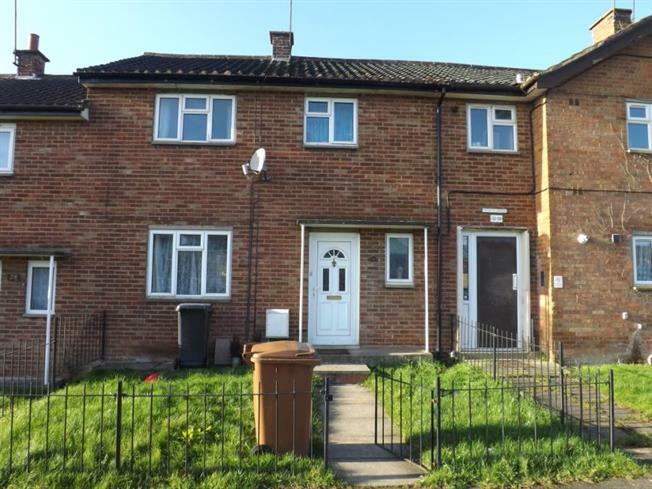 3 Bedroom Terraced House For Sale in Northampton for £125,000. A wonderful opportunity to purchase this three bedroom family home set in the popular area of Eastfields. The home benefits from excellent access to a nearby park, bus routes, schools and a college and a convenience store. The home itself benefits from a refitted kitchen and a lounge/diner to the ground floor, with three bedrooms and a bathroom to the first floor. Outside there is lawned area to the front of the property and an enclosed garden the rear. Call now to view!! Stairs to first floor and doors to kitchen and storage area. Door to lounge/diner, range of wall and base unit with roll top work surfaces, one and half sink/drainer unit, tiled to splashbacks, uPVC double glazed window to rear, spotlights to ceiling, space for American style fridge/freezer, four ring gas hob with extractor hood over, integrated electric oven, double panel gas radaitor, tiled flooring and space and plumbing for washing machine. Double glazed uPVC windows to front, uPVC double glazed doors to rear, two radiators, coving to ceiling, power points, television point, telephone point and timber style flooring. Doors to all rooms and access to loft. Double glazed uPVC window to front, double radaitor, built-in wardrobes, laminate flooring, television point, power points and television point. Double glazed window to rear, laminate flooring, door to airing cupboard and double radiator. Double glazed uPVC windows to front, lamiate flooring, over stairs storage area and power points. Panelled bath with shower unit over, pedestal wash hand basin, low level WC, tiled to splashbacks, opaque uPVC double glazed window to rear and heated towel rail. Mainly lawn area and pathway leading to front door. Enclosed by timber panel fencing, timber shed and patio area.